P. paucipilum Nash, Bull. Torr. Club, 26: 573. 1899. Plant usually purple. Culms 2°-3 1/2° tall, finally somewhat branched, smooth and glabrous; sheaths ciliate on the margin toward the summit, otherwise glabrous; ligule over 1" long; blades 2 1/2'-3 1/2' long, 2 1/2"-3 1/2" wide, erect or ascending, thickish, rather firm, sometimes minutely puberulent on the lower surface, usually with a few hair-bearing papillae at the base; panicle 2'-4' long, longer than broad, its branches erect or erect-ascending, rather dense; spikelets 3/4" long or a little less, a little over \ as wide, oval, pubescent with spreading hairs. In wet soil, southern New Jersey to Florida and Mississippi. 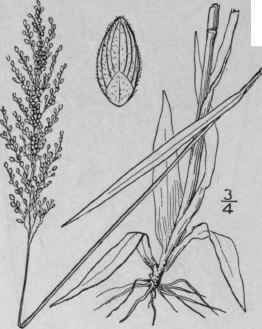 July and Aug.
Panicum spretum Schult. Mant. 2: 248. 1824. 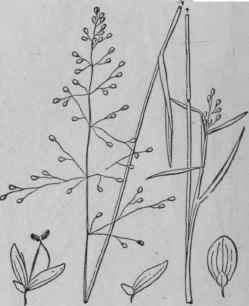 Panicum Eatoni Nash, Bull. Torr. Club, 25: 84. 1898. Smooth and glabrous. 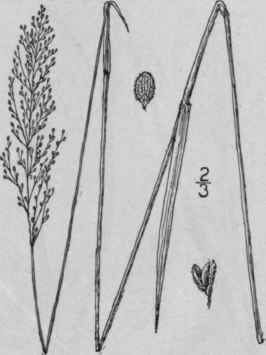 Culms 1 1/2°-3 1/2° tall, erect, at length dichotomously branched and swollen at the nodes; sheaths much shorter than the internodes, usually more or less ciliate on the margins; ligule a ring of long hairs; blades erect, lanceolate, acuminate, 1 1/2'-4' long, 1 1/2"-5" wide; panicle finally long-exserted, dense and contracted, 3'-5' long, 1 1/4' or less broad, its branches erect-ascending; spikelets oval, from over 3/4" to nearly 1" long, acutish, the first scale about one-third as long as the spikelet, pubescent, 1-nerved, the second and the third scales broadly oval when spread out, 7-nerved, densely pubescent with spreading hairs. Along the coast, in damp or wet places, Maine to New Jersey and northern Indiana. May-Aug.
P. nitidum Nash, in Britt. & Br. 111. Fl. 1: 120. 1896. Not Lam. 1797. P. Lindheimeri Nash, Bull. Torr. Club, 24: 196. 1897. Culms at first simple, 12 -18 tall, later profusely dichotomously branched, 2°-3° long, glabrous or pubescent below. 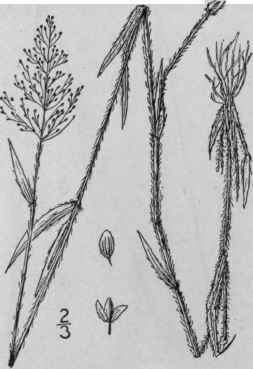 Sheaths less than half as long as the elongated internodes, glabrous, excepting the ciliate margin, or the lower sometimes pubescent; ligule over 2" long; blades glabrous, or sparingly ciliate toward the base, sometimes puberulent below, the primary ones 1'-3' long, 1 1/2"-4" wide, erect or ascending, sometimes reflexed, those of the branches 1/2'-1' long, 1" wide or less; primary panicle long-exserted, 1'-2 1/2' long, ovoid, as broad as long or nearly so, those of the branches smaller and exceeded by the leaves; spikelets about 3/4" long, obovoid, pubescent. Common in dry sandy soil, Maine to Ontario and California, south to Florida and Texas. June-Aug.